A protein-free, one part, premium grade internal and external cementitious floor levelling compound suitable for use at thickness form 2mm to 50mm. 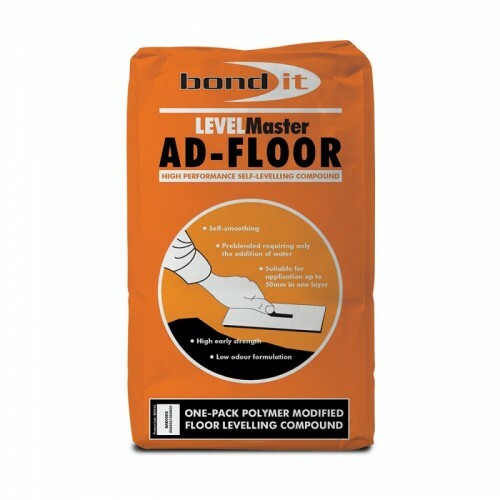 When mixed with water it can be used to level floors providing an ideal base for most floor types. Suitable for external use prior to the application of tiles and interior applications. Can be used to patch repair rough concrete on domestic driveways and paths subject to foot traffic and light and wheeled traffic. Can be used on domestic garage floors prior to painting with a suitable floor paint. CE Approved: Conforms to: EN13813 CT-C35-F10. An ideal underlay for all modern floor finishes. Pour onto the prepared onto the prepared surface and trowel to a smooth finish to a maximum depth of 50mm. Do not mix more than can be laid in 20 minutes. Never add extra water to this product once it has started to set. Do not use at temperatures below 4oC. Surface will accept light foot traffic after 4 hours, thicknesses above 20mm should not be walked on for 24 hours. Leave an additional 24 hours before laying tiles or carpet.